Benedict Cumberbatch and Stephen Fry are among signatories of an open letter asking the government to pardon 49,000 men who were prosecuted for being gay. Members of World War Two codebreaker Alan Turing's family have also signed. Turing, played by Cumberbatch in The Imitation Game, was convicted of gross indecency in 1952 and killed himself in 1954. He was pardoned in 2013. The signatories have asked the Duke and Duchess of Cambridge and other "young leaders" to help with their campaign. But a spokesman for the couple said it was a matter for government and they would not make any public comment. Turing was granted a posthumous pardon by the Queen in 2013, four years after then Prime Minister Gordon Brown offered an "unequivocal apology" for the way he was treated. Now campaigners want pardons for all of those who were convicted of similar offences. The letter, printed in the Guardian, states: "The UK's homophobic laws made the lives of generations of gay and bisexual men intolerable. "It is up to young leaders of today including the Duke and Duchess of Cambridge to acknowledge this mark on our history and not allow it to stand." It describes Turing as "one of the greatest heroes of the 20th century" for helping to crack the Enigma code and says he was "pivotal in the development of modern computers". The letter continues: "The apology and pardon of Alan Turing are to be welcomed but ignores over 49,000 men who were convicted under the same law, many of whom took their own lives. "An estimated 15,000 men are believed to still be alive." 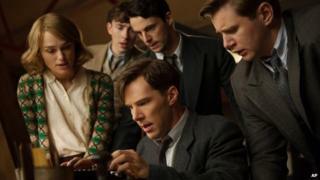 Cumberbatch, who has been nominated for an Oscar for his portrayal of Turing, and The Imitation Game's director Morten Tyldum are also joined as signatories by Turing's great niece Rachel Barnes and Matthew Todd, editor of Attitude Magazine. Ms Barnes told BBC News the royal pardon given to Turing was "fantastic for all of us because he was such a great man and did so much for this country." "But we've always considered that it is totally unjust that only Alan was given a pardon," she said. "There were 50,000 other homosexuals who were convicted and not given a pardon. We would really like this to be put right now." An estimated 15,000 of them are still alive, she added. An online petition has also been launched at www.Pardon49k.org, with more than 60,000 having signed it so far.